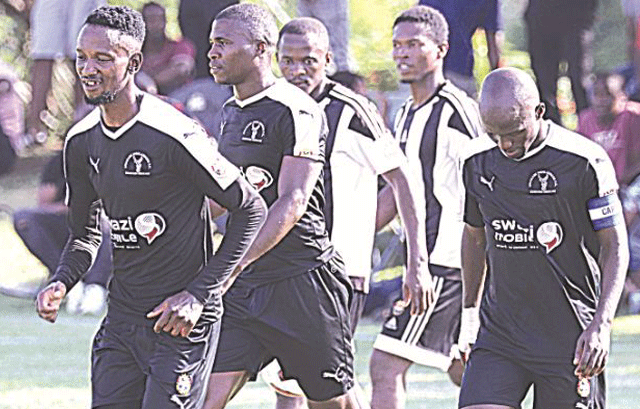 SOCCER – MBABANE Highlanders’ Public Relations Officer (PRO) Paul ‘Magidzeludzakeni’ Masilela has warned his team’s competitors to be worried about the ‘Bull’s form. Masilela spoke at the completion of the Eswatini- Bank Cup round of 32 matches, in which his team were the highest scorers, with a 9-0 win over National First Division League side, City Warriors. Masilela said Highlanders were not expecting any team to stand in their way as they march towards cup victory. “We made a statement with our win on Saturday, and those who will ignore this will be doing themselves injustice. We are a very strong team this season, and I have no doubt that we will win one of the cups,” he said. Asked if there was any team, in particular, that he was worried about, Masilela said he was only worried about reaching the final. He conceded that Wanderers played well against Midas Mbabane City, but said they have clear ambitions. “Now that we have shown that we can score as many times as we want, it is time to win something for our fans. It is time for them to be happy, and they should play their role by rallying behind the team in every game so that together we can achieve what we have set out to,” he said. Highlanders have a date with Young Buffaloes in the finals of the Ingwenyama Cup, possibly next month. Their road to the final of the Eswatini- Bank Cup will be determined by the last 16 draw expected next week. They are two points behind the leaders, Green Mamba FC, who are currently top of the MTN log standings. Meanwhile, the team has appointed a new interim National Supporters Committee. “The directors of Mbabane Highlanders FC noted the decapitation of the National Supporters Committee after almost all its members became engaged in other activities and structures of the team. This, therefore, led to this important structure of the team being decapitated and unable to assist in the smooth-running of the team. It is upon this background that we have decided to appoint an interimNational Supporters Committee, while waiting for the team’s annual general meeting, where the supporters can elect a new NSC. We wish to thank the individuals who were elected to form part of the NSC for always being available and willing to assist the team at any level. We believe that the interim NSC will apply themselves with the kind of love and commitment they have for the team. “We all want to ensure that the team meets its strategic objectives. The appointment of the interim NSC is with immediate effect until the next AGM,” reads the statement.